Be amazed! Take a look at this eyeball-searing shade of red. My poor camera hates it, and I love it! This is the result of switching the normal up a bit. To explain. In the natural course of events, I ran out of my Crimson dye about a week ago. Now, I’ve used two red dyes before. One is Crimson (my favorite) and the other is Fire Red. I had always preferred Crimson because of the deeper color tones. (The Fire Red tended to go orangey.) Well, when I ran out I hastened to order more, but the place I was buying from didn’t have Crimson! It’s a gift, and it’s getting to be overdue. I had a long car ride ahead of me, and a simple stitch pattern, so I went for it. Here is what I got done in three hours of drive time. Well, not all three hours were spent knitting, doncha know, but I gave it a pretty good effort. It is currently fourteen inches long and still crocking. But not badly. Another soak or two once it’s all knit should fix it up just fine. At first I didn’t think I was going to get much done yesterday afternoon. It was rainy, and my enamel pots were still sitting out on the back porch getting soaked. I didn’t quite have the “oomph” to go and bring them in, then scrub them out and dunk all that yarn in hot water. But then it occurred to me that I couldn’t start on either of the knitting projects until the yarn had been dunked and dried, which meant get them in the water now. So, once I got the pots ready for use I started with my newly re-claimed Rebecca yarn. The beginnings of the sweater unraveled fairly well, except for this largest skein. We call it the clown wig. I had to dunk it really well to get rid of the crinkles. I’ve been crocheting away for the past week or so, working on the merino sweater, and now I’ve finished the body piece! It fits quite well, and I’m excited to see how it will block. I couldn’t wait to start spinning up the “Flamenco” superwash merino and silk blend that I got from the Sanguine Gryphon. I’m using my lighter drop spindle on top whorl. I just love the richness of the colors. Wool/silk blends are rapidly becoming my favorite. They draft like butter! 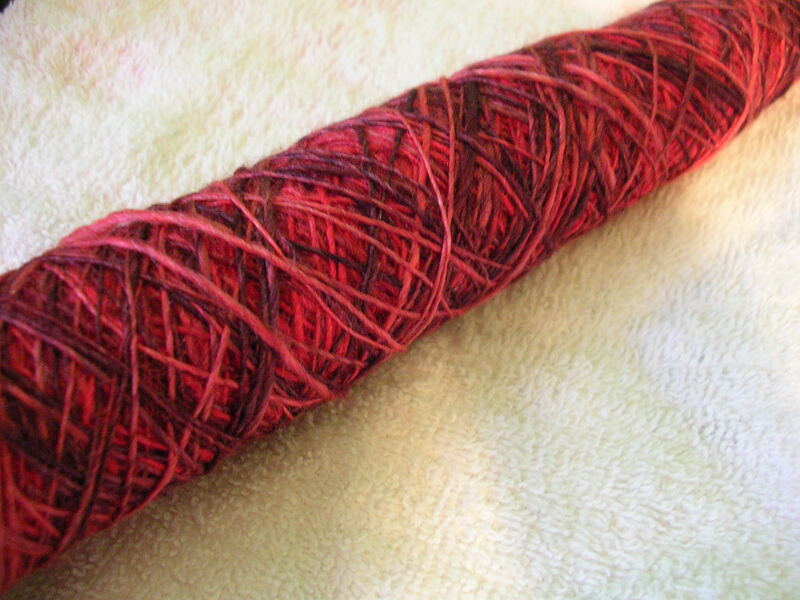 This will probably become the standard, three-ply light worsted weight. Unless it manages to talk me into making it a two-ply sport weight. The single on the spindle is crying to be lace!